What a great Mastermind yesterday. Agents around the office are still really busy so that means there is a lot to talk about. Funny, no one seems to be aware that its summer and the market is supposed to cool down. We were happy to also welcome our 290 Merton manager Brian Torry to our meeting. It is always good to get a different perspective on a variety of topics. So, if you missed Mastermind, you missed a great debate on using Form 109 also known as the Offer Presentation Acknowledgement form. Buyer agents can use this form if they believe the Seller agent is refusing to present their offer. It seems quiet ridiculous that we would even need a form like this since under our Code of Ethics, Seller Agents are required to present all offers to their sellers, but apparently there are agents out there who don’t pay much attention to the rules. Case in Point; Agent Jones shows a property to her client and they decide to put an offer together. It is a bit lower than the asking price but it has been on the market for several weeks. The offer is faxed to the Seller agent with a 24 hour irrevocable. The next day Agent Jones calls the Seller agent to get a status update and is told that the seller will not entertain Agent Jones’ offer. Here is the twist, the next day, the property is reported as sold for $2000 more than Agent Jones’ offer and it turns out that the Seller’s Agent double ended it (sold it to his own client or customer). Of course the first thing that occurs to Agent Jones is that the Seller’s agent had an offer in the background all along and was using her offer to have his accepted. Our Mastermind discussion revolved less around what should be done next and more around the steps that could be taken to make sure your offer is fairly reviewed. Certainly Form 109 is a great place to start but also ask the Selling agent lots and lots of questions before submitting an offer. Questions like; have you had any offers on the property so far?, are you working with anyone who is thinking about an offer?, is the seller thinking about a price adjustment?, what is the seller’s motivation?, what will the seller take?, etc. Of course the Seller agent isn’t obligated to tell you anything but from time to time you will deal with an agent who just wants to make a sale and will give you all kinds of information. Subsequently to our mastermind meeting and as a footnote to the topic above, one of the agents in our office received an offer later in the day that actually included Form 109 with it. It was a strange circumstance where the agent had sold a house that is conditional until July 9th. Another offer came in on the same property conditional upon the first offer falling apart. The Buyer agent included form 109 to ensure that their offer was reviewed. Fair enough! We also had a great discussion on; the complaint process and which levels of organized real estate handle different complaints, a listing agent’s obligation to give you information about other offers, negotiating commissions at the table, and talking points to get your client to increase their offer by a few thousand dollars. All great topics for future blog posts so stay tuned. I encourage everyone to come out and participate in the discussions. At the end of the day you will be wiser and more successful. 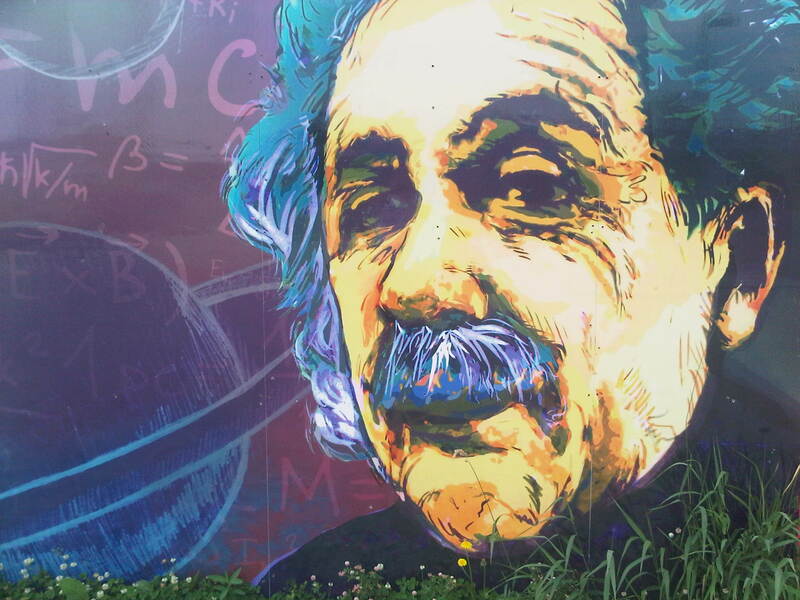 BTW, the Einstein picture comes off the back wall of the building across the street from our office. Thought it was just amazing. It’s like it was put there just for me.